Twenty-eight percent of California households could afford the median-priced home in the fourth quarter, down slightly from the same time in 2017. California’s four million-dollar housing markets — San Mateo, San Francisco, Marin, and Santa Clara counties — all saw affordability improve year over year. 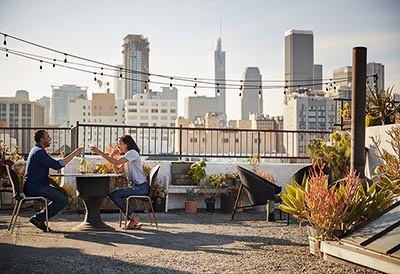 The number of households in the Los Angeles metropolitan area and Los Angeles County decreased slightly from the fourth quarter of 2017 to a respective 30 percent and 24 percent. All four California counties where it takes seven figures to buy a home can be found in the Bay Area, and they were all among the 10 in the state that saw housing affordability increase from the fourth quarter of 2017. The California Association of Realtors’ latest Housing Affordability Index says that 28 percent of the state’s households could afford the median-priced $564,270 single-family home as of the fourth quarter, assuming a 20 percent down payment and a 30-year, fixed-rate mortgage at 4.95 percent. Affordability inched down from 29 percent in the fourth quarter of 2017, which CAR attributes to higher mortgage rates. California housing affordability has been cut in half since early 2012, when 56 percent of residents could qualify for a mortgage on a median-priced home. In the nine-county Bay Area, 22 percent of households could afford the mortgage on a $910,000 home in the fourth quarter, up from 21 percent at the same time in 2017. Bay Area homebuyers need to pull in a minimum of $197,290 per year to qualify for monthly mortgage payments that total $4,930. At nearly $1,519,000, San Mateo is California’s most expensive county, and affordability there edged up from 14 percent in the fourth quarter of 2017 to 15 percent. The number of households who could afford a mortgage also increased on an annual basis in the Golden State’s other million-dollar housing markets: San Francisco (from 12 percent to 15 percent), Marin (from 18 percent to 19 percent), and Santa Clara (from 15 percent to 18 percent) counties. Households in San Mateo and San Francisco counties must earn more than $325,000 per year to make monthly mortgage payments that exceed $8,000. The number of households that could afford a home was unchanged year over year in Alameda (20 percent), Napa (25 percent), and Sonoma counties. Affordability dropped in Contra Costa and Solano counties, to a respective 33 percent and 39 percent. Affordability dipped slightly in the Los Angeles metropolitan area from the fourth quarter of last year, with 30 percent of the population able to afford the median-priced $510,000 home. That trend followed suit in Los Angeles County proper, where affordability declined by 1 percentage point, to 24 percent of households able to qualify for a mortgage on a $576,100 home. Even if California’s housing affordability is about half the national average of 54 percent, buyers here are slowly gaining more leverage. In a new analysis of Bay Area and Los Angeles sales data, Compass Chief Economist Selma Hepp found that price reductions in both of those regions have increased in recent months, as appreciation slows and buyers find themselves with more options from which to choose.